Koh Tachai: What & Where is it? Koh Tachai is a remote uninhabited tropical island. It is just 2.4 km. in length from north to south, and 1.1 km. wide from east to west. On its eastern side is a pristine beach that is 800 metres long. There is no accommodation on Koh Tachai, nor is there anything to do such as visit souvenir shops, restaurants or anything. In fact, on May 15th 2016 Koh Tachai was closed to the public with no confirmed date to reopen. The local authorities say that too many visitors had caused damage to the island and it needs time to recover. Therefore, the crystal-clear waters and reefs around the island can no longer be enjoyed by snorkellers, but scuba diving at Koh Tachai is still possible because divers are deeper in the water, further from the island, and they do not go on to the island at all. The island is located on the eastern side of Thailand, in the Andaman Sea. Geographically, it is approximately half way between The Similan Islands and The Surin Islands. It is 47 km. west of Thailand’s mainland at Phang Nga Province, 36 km. south of The Surin Islands, and 47 km. north of The Similan Islands. West of Koh Tachai there is nothing for more than 500 km., until you reach the Andaman & Nicobar Islands in The Indian Ocean. Koh Tachai & Koh Bon are under the jurisdiction of the Similan Islands National Marine Park. Why is Diving at Koh Tachai So Popular? Koh Tachai diving is the best in Thailand, according to some people. Although Richelieu Rock is the most-common answer to ‘Which is the best dive site in Thailand?’ Koh Tachai is a favourite among many diving professionals. In the past, they could claim that Koh Tachai’s beach made it a better place to visit than Richelieu Rock, which has nothing above the surface to see or do. However, even since the beach has been closed to the public, Koh Tachai is still a favourite dive spot for many people. The regular medium-strong currents and the remote location mean that the marine life here is very healthy. Nutrient-rich water feeds the reef and there is a huge amount of resident and pelagic species at Koh Tachai. Its remote location means that pollution isn’t a problem and most visitors come on liveaboard diving boats and day trip speedboats to dive around the island’s underwater pinnacle. The dive site is large, meaning that even if several diving liveaboard boats arrive at the same time, underwater is not too crowded. Now that the snorkel daytrip speedboats no longer visit, it is an even better place for divers. Day trip diving boats visit Koh Tachai, but most vessels are liveaboard boats, and they usually visit for two dives. Diving at Koh Tachai is possible all day long, including a sunset dive. However, due to the unpredictable and sometimes strong currents, most Similan liveaboard diving boats do not offer night diving at Koh Tachai. Marine life is abundant, healthy and diverse. As well as the thousands of reef-dwelling species, there are always larger fish & reptiles which visit to hunt, breed or even be cleaned. 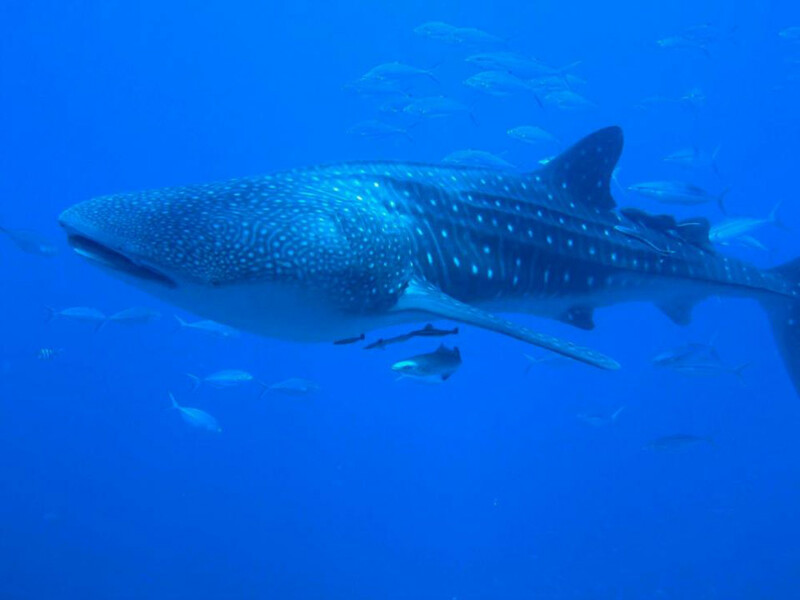 These include the two most popular large fish in Thailand: Manta Rays & Whale Sharks. Divers at Koh Tachai should not expect any guarantee to see these large species, and any encounters should be regarded as a bonus. There are enough corals, fans, reef fish, reptiles and invertebrates to keep almost any diver very happy. In addition to fish and invertebrates, divers can also hope to see marine reptiles, such as a Banded Sea Krait (Laticauda colubrina) or a sea turtle, such as a Green Turtle (Chelonia mydas) or a Hawksbill Turtle (Eretmochelys imbricata). Koh Tachai is most famous for its topography, which consists of huge granite boulders strewn across the sea bed. At the shallowest, the top of the granite pinnacle is around 12 metres deep. The bottom of the dive site is more than 30 metres below the surface. These boulders offer divers shelter from any current, places to explore, and they are home to many interesting creatures. The current at Koh Tachai can be a little bit worrying for some divers, but the same currents bring lots of nutrients and keep the reef very healthy. New divers at Koh Tachai need to listen carefully to the dive briefing and they will soon learn that the boulders give plenty of protection from the current. There are two mooring lines which can be used at the start of the dive to safely descend to the boulders, 12 metres below the surface. These mooring lines are also sometimes used for safety stops at the end of each dive. What Do Divers at Koh Tachai Need to be Aware of? 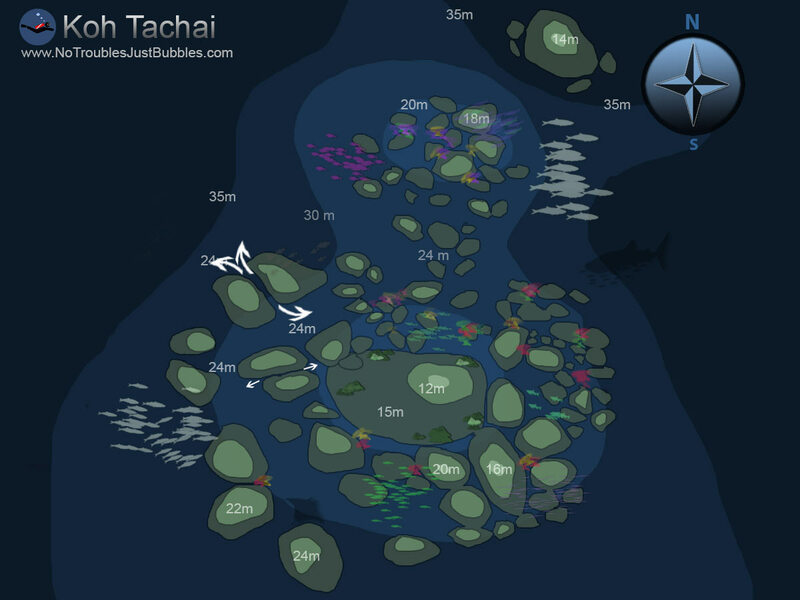 The current is the most-talked-about feature of Koh Tachai diving. Not only is it usually medium to strong, it’s also very unpredictable. The tide charts which are used to predict currents and plan dives may show that it will be going one way, or be a particular strength. Then once in the water divers will notice that the tide chart caused a wrong prediction. As already mentioned, it is very important to pay attention to the dive briefing, in which your guide will explain how to enjoy diving at Koh Tachai without wasting your air or having any problems. Nobody wants a dive to finish prematurely, so they will give you the best advice on how to drop in and descend to the reef. This is usually done over the mooring line and slightly up-current. Once you have grabbed hold of the rope, it’s easy to control your depth, equalise, and descend to the huge boulders. Then, once down there, you will experience a lot of protection from the current due to the size of the reef and boulders. From May 2016, Koh Tachai’s beach is closed to the public. This means that it is no longer possible to visit the beach between dives. In previous years, guests on board Similan liveaboard diving boats and day trip speedboats could go onto the pristine beach and take photographs, go on a mini hike or even play sports. Non-diving guests need to be aware that they will not be able to leave the boat for snorkelling or for a beach visit. This means that Koh Tachai is not suitable for non-diving day trips. It’s very far to travel to, and the only activity there is scuba diving. Learning to scuba dive at Koh Tachai is not normally possible. The minimum depth is 12 metres, and the current is unpredictable and sometimes strong. Therefore, new divers normally learn to dive at a shallower dive site than Koh Tachai. However, the island’s reef can be suitable for the 3rd & 4th dive of an Open Water Diver course. Koh Tachai is a truly wonderful dive site, and to some it’s the best in Thailand. The marine life, topography and the island itself are all naturally very beautiful. Visitors need to be aware that (at present) the beach is closed to the public and no unauthorised person is allowed onto the island. The island is at least 36 km. from anywhere else that has any kind of infrastructure at all. 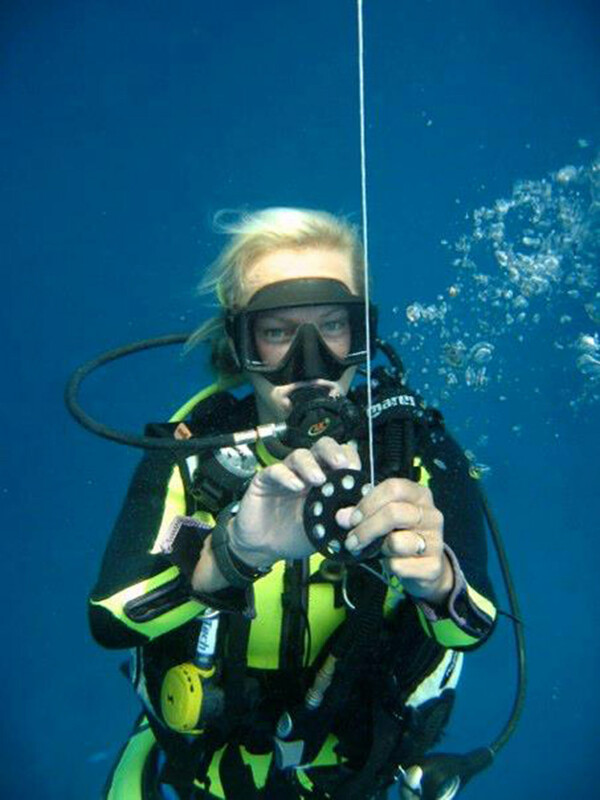 Divers also need to know that the dive site is prone to currents, some which can be strong. However, those who visit Koh Tachai for diving are sure to be impressed. Even without the healthy & diverse marine life, the granite boulder topography is worth the visit. Similan liveaboard diving boats visit throughout the diving season (Oct. - May) and almost all will stay for two dives.